Wirecard has signed a cooperation agreement with watch manufacturer Swatch for “SwatchPAY!”, a solution by which wrist watches will incorporate digital, contactless payment solutions in Switzerland and later throughout Europe. Wirecard has already released “boon”, a mobile payment solution that works completely independently of banks and network operators. 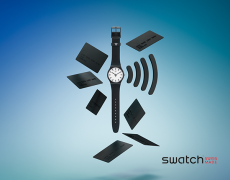 From 1 February, Swatch watches will allow users to add their digital “boon” cards to SwatchPAY!. “Thanks to the latest innovation, tokenisation has never been so quick and simple. It has never been more convenient to pay anytime, anywhere using the Swatch on your wrist: carry out the tokenisation, hold the watch to the payment terminal, done!” says Carlo Giordanetti, creative director of Swatch. The boon card can be set up on SwatchPAY! by going to one of the participating Swatch Stores, downloading the SwatchPAY! app and adding the boon card to the SwatchPAY! wallet. With the app, several watches can be managed simultaneously. The firms say SwatchPAY! and boon are equipped with numerous security functions. Industry standard security features ensure that a user’s card information is never disclosed to merchants or Swatch itself.